Niobium is a chemical element. It is sometimes named columbium. It has the chemical symbol Nb. It has the atomic number 41. It is a rare metal. Niobium is soft and grey. It is ductile. In chemistry it is placed in a group of metal elements named the transition metals. Niobium was discovered in a variety of a mineral named columbite (now called niobite). Niobite is an ore of niobium. 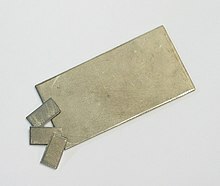 Niobium is used in alloys. The most important alloys are used to make special steels and strong welded joints. This page was last changed on 31 December 2017, at 05:12.